Oh, Martha. With a cover like this, you knew I couldn't resist, right? All those glorious paint chips turned into wall art? These little jars of paint? You don't know me at all, and yet you know me so well. I was powerless to resist. You had me at the cover. And I have been haunting the bookstore nearly daily just waiting for this to arrive, and I didn't even know for sure what would be in it. A blogger I follow regularly made it to the cover with that great purse. Congrats, Beki! As did another favorite blogger who had an article on virtual quilting bees. Way to go, Jacquie! Yep, I'm a sucker for a pretty cover. Very pretty, indeed, and your blog post looks pretty, too! The Martha cover is wonderful. 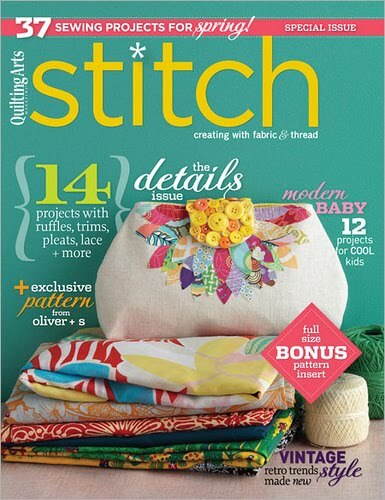 I'll have to pick up a copy of stitch magazine. I've never read it before, but I want to see Jacquie's article. I want to frame that pencil page! Isn't it funny how the blogging community is so supportive that we get really excited when someone we read ends up in a magazine? I love it. It's great that handmade beauties like this gets appreciated. I think we need to celebrate things like this more. Thanks for the post! that is a truly spectacular purse! And how fun is Martha's displa of color and freshness? Great to see wonderful projects in magazines. I love to buy quilting magazines but often get disappointed that I can see more modern/interesting quilts without paying a cent (these kinds of blogs). Congrats to your friends! Never heard of this magazine, but I will definitely have to go see if it's at Borders Books! Thanks!